A new set of hands-on images provide one final look at LG’s next flagship device ahead of its reveal. 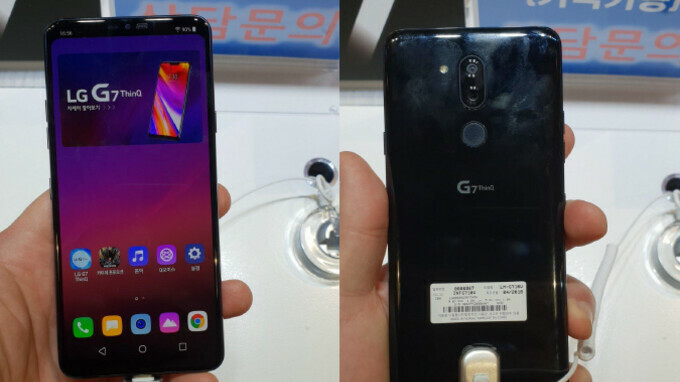 The G7 ThinQ is currently set to be unveiled tomorrow, May 2, at an event in New York City, where it could be accompanied by yet another updated LG V30, dubbed the V35 ThinQ, and possibly a new mid-range LG Q7 lineup that may feature a stylus-equipped smartphone. Nevertheless, with just one day to go, the latest leaks continue to focus on LG’s flagship. As can be seen in the images, LG’s new flagship sports a large display on the front panel alongside minimal side bezels and a small chin down below. Also, up top, the company has placed a small notch that is home to a front-facing camera and an in-ear speaker, although, in the images in question, this is hidden via software trickery. Moving on to the LG G7 ThinQ’s frame, a power button can be seen on the right side, while on the left, two separate volume keys are also present. Furthermore, the rumored Google Assistant button can also be seen. Flipping the device over, the new glass build is present but, if these images are anything to go by, it could potentially be quite a fingerprint magnet, at least in terms of the Aurora Black variant. In any case, the back-panel sports quite a simplistic design, with the company’s signature dual-camera setup making a return in the form of two, 16-megapixel sensors accompanied by a dual-LED flash. The LG G7 ThinQ is currently expected to ship with Qualcomm’s Snapdragon 845 processor on the inside. This is rumored to be coupled with 4GB of RAM and 64GB of internal storage while, on the software side of things, Android 8.1 Oreo should ship straight out of the box along with LG’s custom overlay on top. In regards to availability, LG’s G7 ThinQ is expected to go on sale by mid-May and will be sold in a variety of colors: Aurora Black, Platinum Grey, Raspberry Rose, and both matte and glossy Moroccan Blue options. Big bottom chin AND software buttons is something I´ll never understand. Meh, doesn't look too bad tbh.. Doesn't look iphone X good but not half as bad as we're making it out to be tbh.. The good thing with Android you can hide the navigation and status bar even if it's not offered by default by the manufacturer. what bothers me is the design aspect. I believe they are going to fix the bottom chin on the LG G7 ThinQ S V2 or on the LG G7 ThinQ S V2 Marvel Infinity War Special Edition. S9 big bottom chin and Software buttons, Huawei P20 series big bottom chin etc. Those icons are so ugly. LG is truly the pits. Do we have any further information as to what time the event takes place tomorrow? Holy s**t what a disaster of a phone. Looks like something from 2012. This is why it’s only a two horse race in the Android, and LG is out. In fact, I like how clean this one looks. If only there were no notch. You should really check out the Galaxy S8 and S9 then, as the LG G7 with no notch is essentially Samsung's infinity design language, other than the fact that Samsung's design is a little more refined and elegant, imo. LG should have removed the bottom chin ala iPhone X. It's not a matter of "they should". The problem is they could not. Phonearena took down the camera samples, lol. I think John V. jumped the gun a little early.lol I hope the performance is better than what I saw though. For all that j can get the better looking, notch-less V30 and be happy with that. G2 was the only G good. Except lack of sd slot. Funny thing is, this phone reminds me a lot of the G2, bit sad though that 6 years later this is the best they can do. Definitely. Having the ability to switch the launcher and icon pack on your smartphone is amazing, it's definitely something i wouldn't want to do without. So, what to expect tomorrow....Whether the phones wow us or disappoint us, after tomorrow's presentation, there will be silence from LG, besides the ambiguous "soon" as a launch date. The phone's actual launch will be around mid June.